An asylum seeker calls out to journalists on Papua New Guinea's Manus island, August 2013. EOIN BLACKWELL/Press Association. All rights reserved. The international trend in first world countries towards right wing populist politics is symptomatic of rising insecurity and inequality. Each context has its own specific topography whilst there are underlying dynamics that seem common to all. It may surprise you to learn how far down this trajectory Australia has gone this century. Observers of international human rights know about this, as do figures like Donald Trump who looks on Australia’s inhumane treatment of “illegal” refugees with envy. Alas, the story needs to be told such that hopefully Australians will develop a conscience and the rest of the world might be warned. The title I gave this piece – Nazi Australia – was deliberately provocative. This is a function of desperation, but, alas, also of reality. For there are hundreds of men on Manus Island (PNG) whom the Australian government has placed in interminable limbo, and psychological and physical danger, so as to maintain an absolute deterrence against “illegal” asylum seekers. The Australian government simply stonewalls all calls by outraged citizens for humane action. So, there is need to call out this stonewalling in very shrill terms. Even so, the claims I am making are very serious, and this will require me to set the argument up carefully. Tyson is an English name. My father’s family were craftsmen from York who received assisted travel to go to Van Diemen’s Land in 1852. My family were economic migrants looking for a better life. My mother’s family were Irish Kennedys whose origins in Australia are conveniently unknown by my family; likely ‘criminal’ offshore indefinite detainees tossed to the other side of the world as part of a no compromise ‘law and order’ push. In other words, I am a classic British Ilse origin seventh generation White Australian. I am of the tribe who likes to think our language, culture and way of life defines ‘Australian values.’ We all came by boat and totally displaced the original way of life that was here before we came. Ironically, we fear boat arrival invaders, we don’t want ‘economic migrants’ to come here and prosper as we did, and we have no sympathy for criminalized off shore detainees. There is a profound inchoate self-loathing in the flag waving, race- and religion-based fear of boat arrival refugees in my tribe, for our own sins haunt us, though we will not face them. This – in what we delusionally like to think of as an easygoing lucky country – provides ample fuel for the fires of fascism in our country. By ancestry, I am a classic White Australian. However, my children are more ‘Continental’ than I am, for I have married the daughter of a post-war migrant family from Germany. Karl, my father-in-law, was born in 1927 and fought bravely for his country as a youth in the terrible closing year of the war. Karl was shot in the knee, in the water, in Holland. He was fished out by the English, hospitalized and fed. He still remembers the wonders of good medical care and of real coffee and the novelty of white bread as a wounded POW. Like nearly all German POWs, he spent a couple of years locked up being processed after the war, until he was able to return to his home. But Germany was in ruins and Australia wanted White immigrants to populate our nation so as to secure ourselves against the Asian hoards we so feared. So Karl came to Australia in 1952 on a two year contract for a German company, with all his worldly goods in a single suit case. He taught himself English by reading the newspapers, fulfilled the terms of his contract, then stayed. Like many post-war migrants from war devastated Europe, he worked multiple jobs at the same time, and by staggering hard work, intelligence and diligence, became very prosperous. Allied post-war attitudes towards the evil German Krauts always slightly rile Karl. He has a deep suspicion of demagogues, and the things he is most pleased about from his youth and war service is that he never shot anyone or denounced any Jews. Karl has absolutely no nostalgia or pride for the militant German imperialism and genocidal scapegoating context in which he grew up. But – here in Australia – history is written by the winners. The racist simplicity of Aussies confronting the thickly German accented Karl with ‘you killed my father’ is not easy to swallow. Karl notices the moral incoherence when Australian flag loving militant patriotism is treated as an unquestionable good, but the German or Japanese soldier is inexcusably evil for practising the same unwavering loyalty to country. There is a strong undercurrent of moral superiority from ‘us’ Allied Good Guys to ‘those’ Axis Bad Guys. With Karl, I have no sympathy for using the term Nazi in a simplistic self-congratulatory manner that presupposes the innate moral superiority of the Allies. However, the Nazi regime really did embody fascist and genocidal evils. The war against those evils really was a morally significant struggle, and the determination to make sure these fascist and genocidal herd movements were never repeated again, really did define the post-war Australia that I grew up in. It deeply disturbs me that we are increasingly unconcerned about fascist, police state and concentration camp supporting trajectories in Australia today. The militant nationalism, ‘strong leadership’, and racist scapegoating that characterized the rise of Nazism in Germany is being followed today in mainstream Australian politics. That rise was not looked on with much concern by many law and order militant nationalists in England and the US in the 1930s, just as its rise in our society today is not looked on with much concern here. But when the militarized interests of the nation trump the rights of citizens to know about and question the actions of our government towards vulnerable ‘Others’, we are moving in a Nazi direction. We set things up on Manus Island such that the men that we put there are being deprived of food, water and basic health facilities and live not only with an imposed limbo but a justified fear for their safety. When we have no commitment to genuinely universal human rights but are prepared to set up off shore concentration camps that are designed to traumatize our detainees, we have abandoned the post-war horror of the Holocaust. We set things up on Manus Island such that the men that we put there are being deprived of food, water and basic health facilities and live not only with an imposed limbo but a justified fear for their safety. Ten men whom the Australian government put on Manus Island have died their either by violence from locals, or from their own hands out of total despair. Since the Australian funded Manus Island detention centre has been closed, I have emailed my Prime Minister repeatedly warning him that our government risks having the blood of these men on its hands unless he relents from our inhumane deterrent absolutism, insisting that these people will NEVER come to Australia, be they refugees or not. I have received no reply from his office. I notice that on the PM’s webpage there are a string of warnings about how to write appropriately. Offensive emails will be ignored and destroyed and emails that his office interprets as threatening will be referred to the Australian Federal Police. So – having received no reply – I do not know if I am just considered offensive and dismissed, or if I am under investigation by the National Intelligence Community for my abhorrence of a legal Australian security policy. It seems the only sort of email one is likely to get a reply from is either applauding the PM for his excellent work, or very gently suggesting that maybe he should tweak his policy directions slightly, all the while acknowledging his good intentions. Genuine outrage at his policies seems likely to draw a total blank or be referred to the investigative branch of our internal security police. Does this make anyone nervous about the state of political discussion in Australia? Germany is now far more strongly committed to universal human rights, citizen and civil liberty protections against the police ‘security’ state, and the hosing down of political demagogues, than is Australia. We have German friends who were permanent residents in Australia who have gone back to Germany because of the Australian political sea change that has been going on here over the past two decades. The shift of the political mainstream to the right; the vast increase in police powers with various responsibility and powers acts in the early 2000s and following; the amazing ‘security’ surveillances that modern technology makes available to the state (such as mandatory biometric photographs for car licences and passports); the reneging of our commitment to universal human rights: shifts of this nature made our German friends too uncomfortable to stay in Australia. Germany has been made to remember what happens when you let this sort of trajectory have its head, and post-war Germany’s constitutional safeguards and their political culture is very uneasy with what is going on in places like Australia. Germany is now far more strongly committed to universal human rights, citizen and civil liberty protections against the police ‘security’ state, and the hosing down of political demagogues, than is Australia. And – unlike Australia at the bottom of the world – Germany carries a real refugee burden following the crisis in Syria. I have not a few German relatives who lived through the Second World War. They were either children or ordinary good citizens. They largely trusted their government and did what they were expected to do as good nationalists. As Bonhoeffer’s lonely witness attests, the ordinary ‘good citizen’ had less excuse for compliance with the mainstream of the day than any claim to ignorance and respectable conformity can really bear. Even so, once a ground swell of state-funded conformist propaganda and harsh internal enforcement regimes are in place, it takes unusual courage and independence to stand against it. The majority of Australians would have done the same as my German relatives had we been in their position. Indeed, today, good citizen Australians seem remarkably similar to good citizen Germans in the 1930s. But we are not similar. We have far less excuse than they had, for we know what happened in Nazi Germany and we defined ourselves in the post-war era as not being like the Nazis. We cannot pretend that we are ignorant of what political ground swells towards militant nationalism, the police state, and the race- and religion-based scapegoating of displaced vulnerable people leads to. Nazi Australia. Is it here already? Is Australia on the edge of its own 1930s, all primed to dump her fears and failures onto the heads of carefully prepared scapegoat groups? Has Australian been carefully prepared to accept some ‘strong leader’ who can harness the irrational resentments and clandestine herd reflexes of the insecure mob in order to make Germany/Australia/America great again? Do we just need another 1929, another 2008, to push us into the same trajectory of fascist inhumanity that we thought we would never allow to happen again? If we do not step back from racism and religious scapegoating in our politics, if we do not re-affirm a genuine commitment to universal human rights and our refugee responsibilities under the UNHCR, then we are indeed becoming Nazi Australia. 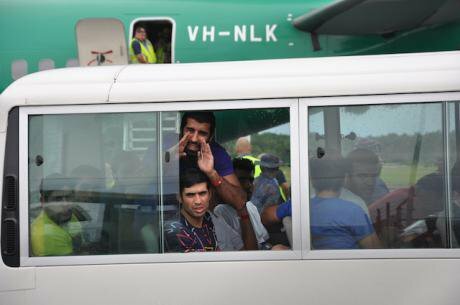 The men on Manus Island are yet another carnie in the coal mine on the point of expiring. As the 1930s demonstrated, give this dark energy its head and horror for all of us, not just the men on Manus Island, will follow. We must step back from the brink. Views expressed in this article are Paul Tyson’s own opinion and do not represent any official position endorsed by Emmanuel College.